Wednesday April 19th 1893 I was busy all forenoon doing baking in my new stove. My bread was very nice. I think it a great success and Will went to the Dental Clinic to get a tooth fixed. It was a rainy disagreeable afternoon. Fanny was at home all day. Thursday April 20th 1893 It snowed nearly all day. I was busy all forenoon with getting the dinner and cleaning out the dining room closet. After dinner Will got some soft coal and we were experimenting with the furnace in the afternoon. It did good work. Friday April 21st 1893 It snowed all the forenoon. I was busy with the work and in the afternoon Fanny and I went up town to get us a hat. It was late when we got home and I was chilled through. We spent the evening at home. We were invited over to Robinson but could not go. 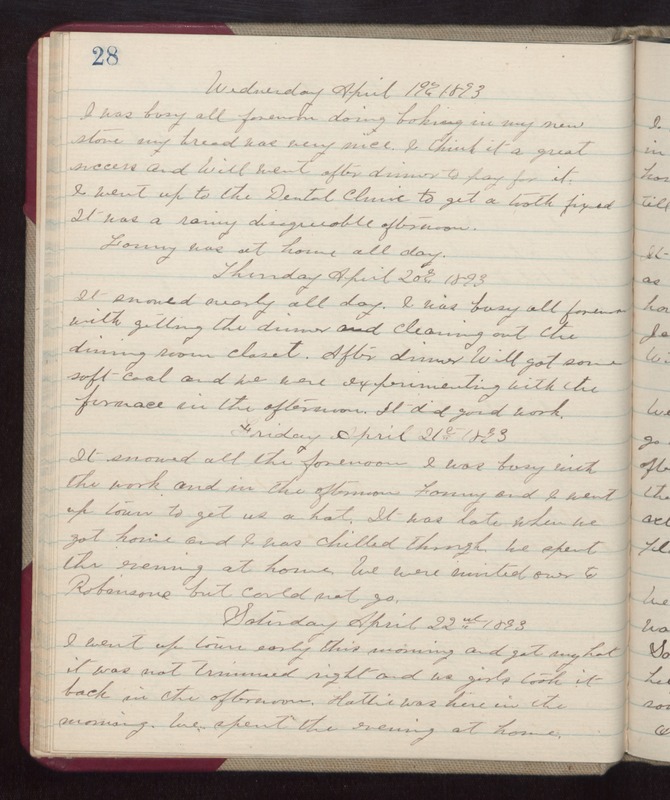 Saturday April 22nd 1893 I went up town early this morning and got my hat it was not trimmed right and us girls took it back in the afternoon. Hattie was here in the morning. We spent the evening at home.